Complimentary round-trip hotel limousine transfers from most major hotels located on the Las Vegas Strip & Downtown Area. You will be collected from your Las Vegas hotel in a limousine to be transferred to McCarran Helicopter Terminal ready for your Grand Canyon Helicopter flight which passes over the impressive Hoover Dam, Lake Mead and the epic Canyon itself. The landscape below transforms from salt marshes to extinct volcanoes as you journey towards the highlight of the tour, and soon you are descending into a stunning valley for a breathtaking final approach to the landing zone at the West Rim. Once on the ground, you will have around 30 minutes to eat a picnic lunch, sip a champagne toast and pose for some breathtaking photo’s backdropped by the stunning surrounds before your flight ascends the 4000 feet canyon walls for your journey home. The time of the return flight is scheduled to coincide with the setting sun culminating in a swoop across the strip itself - a kaladiescope of neon-colour, non-stop action and man-made splendour. Flights vary between 2.30pm in the winter and 5.30pm in the summer to culminate with the sunset - precise time will be advised upon reconfirmation. 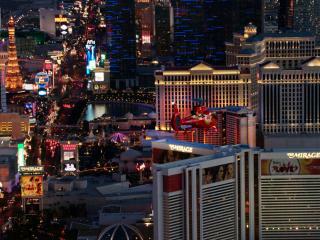 Las Vegas hotel pick-ups start up to 60 minutes before the departure time. Flights depart from McCarran Terminal in the heart of Las Vegas. About 3.5 hours from hotel to hotel. Helicopter flights to the Grand Canyon are about 45 minutes each way. Total flight time is around 90 minutes in total. Flights depart from McCarran Terminal.